“When you think of a pirate, you think of freedom,” Vampire Coast designer Mitchell Heastie says. 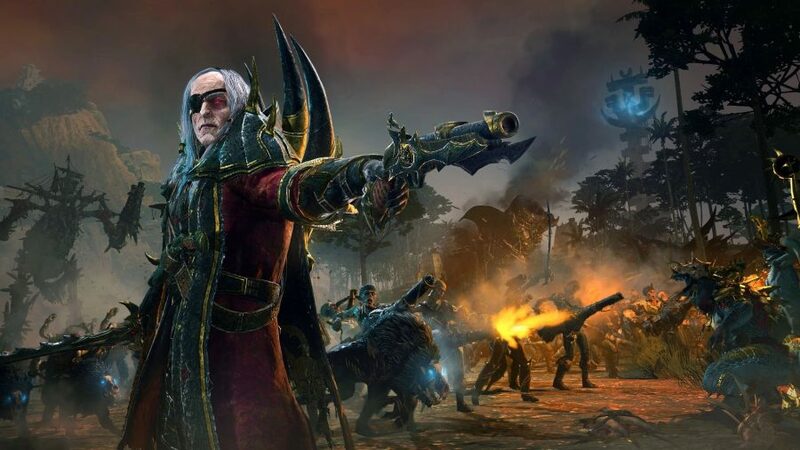 “They sail the seas, do whatever they want, and that’s something we wanted to offer to the player.” It’s a philosophical point that underpins Total War: Warhammer II’s most recent DLC, and particularly Luthor Harkon’s campaign. Luthor’s backstory is one of the most colourful in Warhammer. A member of the Harkoni tribe native to the hills around Lahmia, where vampirism began, Lutr Harkoni was sired by one of the first Blood Dragons – a vampiric bloodline that values honour and martial skill. Centuries after Lahmia fell, Luthor resurfaced when Norscan raiders made off with the cargo of an Imperial merchant ship. Unfortunately for them, said cargo included Luthor’s coffin. When their ship eventually crashed on the coast of Lustria, they all had a serious case of You’re Undead Now, and Luthor was very much in charge. He built a new home for himself where he landed, founding an undead enclave in the jungle that became known as the Vampire Coast. While exploring the neighbourhood, Luthor came upon the abandoned Lizardmen city of Huatl, and had the bright idea to plunder it. In so doing, he disturbed a series of protective glyphs that severed his connection to the Winds of Magic, and scrambled his mind. There’s a lesson in there about failing to take heed of your own origin story. It’s a lot to work with. So what did Creative Assembly want to emphasise most? Luthor’s madness not only shapes his personal journey in the campaign, but also his distinctive role in combat, painting him as a jealous anti-magic hero. It’s encouraging that Creative Assembly is still able to find niches for new Legendary Lords – even though there are now 50 of them in the Mortal Empires campaign that gathers both Total Warhammers and their DLC. With only so many systems to work with, it’s becoming trickier to differentiate new characters. Luthor's journey to repair his mind and landlubber starting position make his campaign one of the best in the Vampire Coast DLC. Count Noctilus delivers on the pirate-sorcerer fantasy, but has fewer interesting choices to make. Harkon also has an uncommon level of utility in his toolkit, reflecting his varied background and, perhaps, his scattered brain. “He’ll hold his own in a duel, depending on the matchup,” Deans says. That’s a consequence of his vampiric strength and Blood Dragon heritage. And yet, being a pirate, he has a pistol, so “he can fire on the move and do a bit of harassment if he wants to”. Moreover, with access to a Terrorgheist as a mount option, he also has excellent mobility. “He’s quite diverse in how he plays,” Deans says – just as he’s diverse in his personalities. 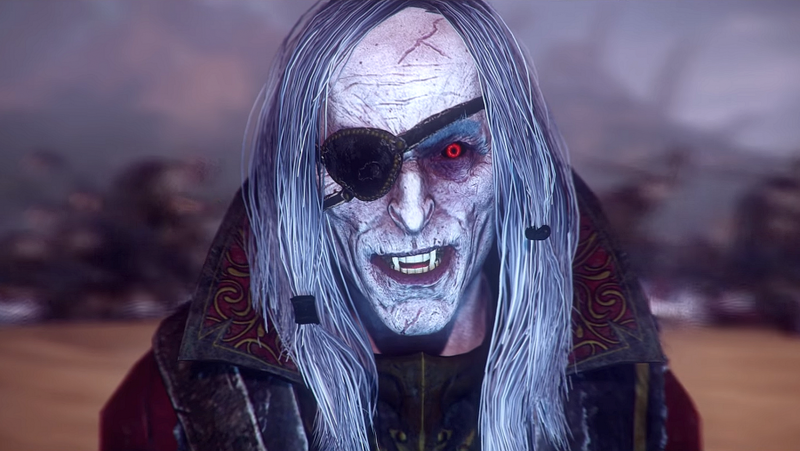 The Vampire Coast reveal trailer drove a lot of hype for the DLC, and Luthor Harkon was its charismatic star. It’s clear something’s not quite right when he talks to a corpse, to the camera, and to himself – in the plural. But his voice also plays a big part. Nasal, almost snivelling, and yet not comic, it quivers, like an over-taut guitar string liable to snap, adding a deranged, threatening quality. Harkon’s madness is well-communicated at a physical level, too, with his twitchy animations. And there’s one touch I particularly enjoyed – his sword, which he often holds downturned, like a cane. Total War: Warhammer II’s Luthor Harkon is a remarkably coherent depiction of a fragmented mind, one which has required coordination across several disciplines: animation, art, sound design, gameplay design, and – let’s not forget – the cinematic team, who threw in a lovely touch all of their own that the community picked up on: Luthor’s creepy smile (“We always love the trailer reaction – it’s one of the most exciting parts of the job, to be honest,” Heastie says). This is a character for which some old and scrappy fluff exists, but very little artwork, and almost no new material outside of End Times lore, which Total Warhammer doesn’t – yet – incorporate. Nonetheless, Creative Assembly has brought him to life triumphantly, creating one of its most distinctive Legendary Lords to date, more than two and-a-half years after the release of Total War: Warhammer.